I’ve had so many people asking about how we make our hoops, and I realized that I haven’t really been specific about it. So…here are some specifics! Do keep in mind that everyone has different preferences and while one size/weight might work for me, it might not be your favorite. Experiment and find YOUR favorite! Sizing is such a hot topic that there are almost 50 pages of posts on Hoop City about it. So if you want more info, do some reading over there as well. 3/4 inch / 100 psi tubing is my favorite right now. It’s nice and light, but can be made heavier with tape. I do like the 160 psi for beginners, but it can sometimes be too heavy for little children. It can also be very heavy if you put more than one layer of tape on it. I have a big 160 with 2 layers of tape and that thing is a beast! The 100 psi seems to be the best “all-around” tubing for us. We have found that Menards is the cheapest place to buy tubing if you have them in your area. Lowe’s and Home Depot will carry them, but they don’t always have the right size, so call ahead. Lowe’s is selling 3/4 160 psi at $50 a roll in some areas, so beware! Apparently they increased the price some time back…yet another reason why we like the 100 psi. Vinyl or electric tape makes a great base, but don’t underestimate the effectiveness of gaffers tape. It gives you that nice “grippy” feeling on your body as it goes round and round. Don’t be discouraged if taping is a little difficult when starting out, there is an “art” to it…it takes some practice. 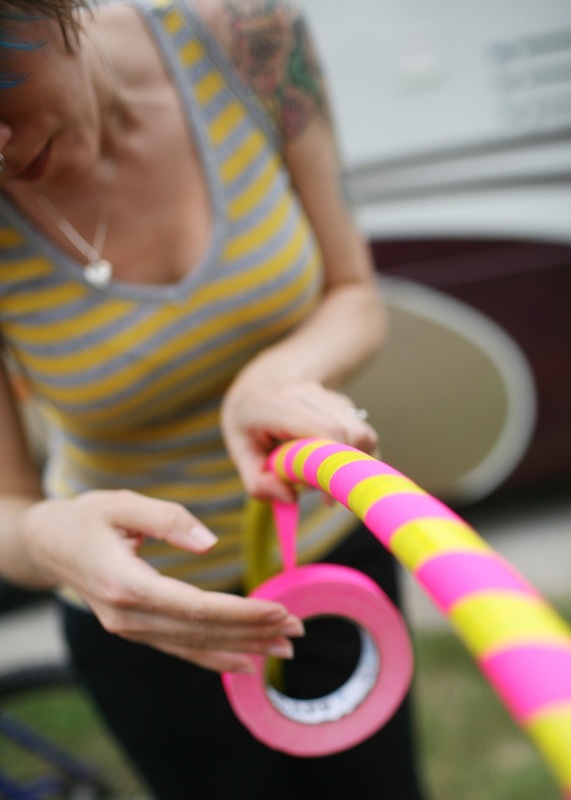 I hope to make a video next time we make some hoops to demonstrate taping, etc. It’s really pretty easy though, so don’t be scared! Start with a hoop that is about 2 inches above your belly button. For adults, this is usually somewhere around 40-43″. Don’t get stuck on the numbers though…Bella loves to hoop with the really BIG hoops! If you want to get particular on lengths instead of just eyeballing it, here is a circumference calculator. Here is the link to one of the “classic” hoopmaking sites. Please be aware that the collapsible instructions he gives are a bit involved and it’s not the same kind of collapsible hoop I am talking about. *If you’re in the Austin, TX area, there is a hoopmaking class with Laura and HoopCircle this Saturday (May 29). More details here.